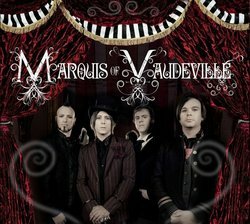 Having the ambitious wish to propel the entire world into a melodic vortex, Marquis of Vaudeville emits an extraordinary sound that spirals listeners on an utterly imaginative, musical merry-go-round. One never knows what moodswung journey they'll embark upon once these musical highwaymen hijack their consciousness. The group is known the world over for their progressive, psychedelic, punk cabaret stylings, fusing timeworn elements of the old world with newfangled innovation, and due to the music's mysterious, yet playful nature, they have befittingly dubbed the style "melodic mischief". Internet and terrestrial radio such as Dallas' leading rock/alternative stations 97.1 The Eagle and 102.1 The Edge have embraced their music and featured such songs as "Corps of Night"; a rebellious anthem to lead the lost and hearten the forgotten. Doug Brod, former Editor for Spin Magazine had this to say of their compelling music, "Venus to Vertigo and Bright Star Hope, that mix of pleasant pop and hard-rock dynamics, this stuff is so slick and well-constructed. Very impressive." Amanda Palmer of The Dresden Dolls applauds the band with, "Ziggy meets Marc Bolan outside Max's Kansas City. Makes me want to break out some sequined leggings and spit on the sidewalk. Space-age modern-age glam nostalgia." Alan Ayo of the Dallas Observer and a former DJ of 102.1 The Edge praises the band's vibe stating, "Marquis of Vaudeville's self-titled debut is a shrewd fusing of twinkly pop, gaze-at-the-stars vocals and melancholy melody outlined with edgy, trenchant guitars...This is music to paint your own mental picture while listening to-a healthy dose of rock 'n' roll with a fair share of emotion, invention, and imagination."